So here's where I am stuck! I have it basted together with a backing that I love and I purchased some green thread that works well - I think. White worked on the front but not the back and the opposite is true of cream. Green was a good compromise :) My original plan was to go straight line 1/4 inch on either side of the seams, but not all of my seams match perfectly . . . did I tell you how much I have learned in the process of making this? My current thought is to use a decorative type stitch over the seams, but not every seam - that would be too much. And I would love to be able to stipple but I don't want this to be the first piece that I actually stipple quilt - too much pressure. But then again maybe I need that pressure. 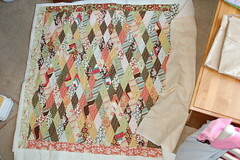 As you can see this quilt puts me at a total loss! I have a few more pics on flickr if you want to see details. Thanks Rachel for reminding me about flickr! I don't have any advice-but I still am amazed at how beautiful the quilt is! I just love it. I think a stipple would look great. The quilt is beautiful! I love it!!! You are one talented chica.